I’m not a morning person. I never have been, and I doubt that I ever really will. I’m the kind of guy that gets up, showers, dresses and still looks and acts like a zombie. The last thing I need in the morning is some way to make my routine more dangerous, because lets face it, I’m clumsy enough when I’m not groggy. Needless to say, this toaster won’t be making its way into my kitchen any time soon. I can certainly see the appeal of this toaster, as it looks much cooler than your average stand-up version. 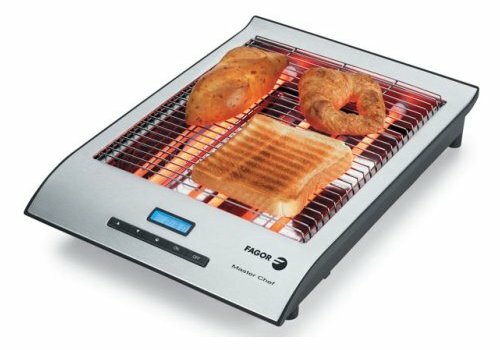 Unfortunately I can’t see any real benefits to this Fagor TP-2006 X Flat Toaster, except maybe you can toast larger items. That aside, all I see are negatives. First, you’ve got a surface lined with extremely hot wires with no way to cover them (except with things to toast), so it is rather dangerous. Then, you’ve got to manually flip over your toast, instead of having both sides heated at once. No word on pricing or availability. You sure this isn’t a wall mounted space heater?? I can imagine someone using this like a regular cooking grill. Then they would pull out a fork to turn stuff over and then… *whoop* drop it in there starting an electrical fire. I’m sorry, my cats like to jump on the counter. I join you in stating that I will NEVER get one of these. makes great toasted cheese and warms up soft taco shells perfectly.